The tragedies and hardships of Jews in Berlin are well known. During the dark period of Nazi rule, a lot of Jews were tortured to death and were actually an integral part of the making of Germany initially. This is the main reason as to why creating a memorial for them was of utmost importance to Berliners who cannot remove this fateful past from their lives. Neue Synagoge is one such place. This Synagoge was initially a worship place for the Jews before World War II and then like many other natural treasures got destroyed. After re construction today, it serves more as a memorial than a worship place. There is also an accompanying museum to take you through the journey of Jews during the time of the Nazi period. Closed on Kippur, Christmas eve, Christmas as well as New Year. The dome may only be climbed from April to September. 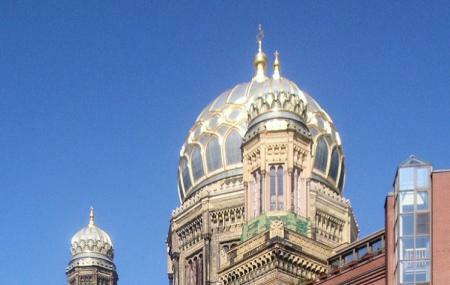 How popular is Neue Synagoge? People normally club together Friedrichstrasse and Hamburger Bahnhof while planning their visit to Neue Synagoge. Beautiful place! Synagogue and museum at the same time. I liked that I could see the damaged made during WW2. It made me think of how much this place and people part of it had to go through. Architecture is beautiful outside and inside too. Peaceful place full of history is what I found this place to be like. Synagogue with Jewish museum. The prayers are only on Friday evening and Saturday, by a conservative equal Jewish community. And sometimes they are hosting special events. There is heavy security around the building and the entrance is through a metal detection and guards. The building is nice and decorative, and all of the people involved are very pleasant and kind. It is/was one of the largest and most beautiful prayer complex of Jews. However, due to damage during WW2 by allied forces, it is not fully functional prayer synagogue. Photography is not allowed inside and security checked are high. 2 other policemen are always outside the Synagogue. The dome is closed in Winters. Prayer hall can't be seen. So, practically it has a museum with permanent and temporary exhibition to set the expectation right. But, it has some amazing people guiding you through and if required, explaining details on Judaism that it makes the overall experience amazing. Wow, one of the best 'museums' I've ever bin. Very good collection that is well maintained. You can feel that this is still a working synagogue. It also feels very personal, all the stories of the people who used to go there before it got destroyed and members who died during the Holocaust really get to you. This is a must visit for everyone who goes to Berlin.